The hours after school, on weekends and during the summer can be times for growth, learning and change. Pinkerton supports community-based programs that offer engaging activities, strong mentoring relationships and opportunities for cultural enrichment and building new skills. As the product of a low-income family in Washington Heights who went on to become a star dancer with the New York City Ballet, Jacques d’Amboise certainly understood the transformative power of the arts. In 1976, he made a major commitment to extend that opportunity to New York’s young people by establishing the National Dance Institute. 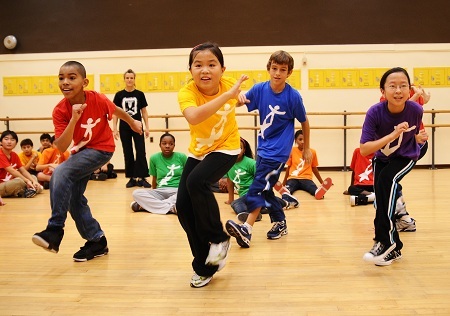 Today the NDI operates in-school dance programs for 5,000 fourth, fifth and sixth graders in 31 New York City public schools. A master teacher/choreographer, a musician and an assistant lead the students through exuberant, almost aerobic routines that culminate in performances for the entire school. The dance workshops, often supplemented by visiting international artists, are also geared to cultivate global awareness and cultural literacy. Each year 200 highly motivated young people are invited to join the NDI’s Irene Diamond Summer Institutes and the weekly workshops of group’s Celebration Team. These talented dancers undergo advanced training and participate in highly-acclaimed performances for audiences throughout the city and beyond. The Pinkerton Foundation has supported the NDI with thirteen grants totaling $775,000 since 1996. The Foundation also awarded a $250,000 capital grant in 2010 to help construct NDI’s permanent headquarters and dance facility in central Harlem.